Bezalel made the ark of acacia wood; it was two and a half cubits long, a cubit and a half wide, and a cubit and a half high. 2 He overlaid it with pure gold inside and outside, and made a molding of gold around it. 3 He cast for it four rings of gold for its four feet, two rings on its one side and two rings on its other side. 4 He made poles of acacia wood, and overlaid them with gold, 5 and put the poles into the rings on the sides of the ark, to carry the ark. 6 He made a mercy seat of pure gold; two cubits and a half was its length, and a cubit and a half its width. 7 He made two cherubim of hammered gold; at the two ends of the mercy seat he made them, 8 one cherub at the one end, and one cherub at the other end; of one piece with the mercy seat1 he made the cherubim at its two ends. 9 The cherubim spread out their wings above, overshadowing the mercy seat with their wings. They faced one another; the faces of the cherubim were turned toward the mercy seat. 17 He also made the lampstand of pure gold. The base and the shaft of the lampstand were made of hammered work; its cups, its calyxes, and its petals were of one piece with it. 18 There were six branches going out of its sides, three branches of the lampstand out of one side of it and three branches of the lampstand out of the other side of it; 19 three cups shaped like almond blossoms, each with calyx and petals, on one branch, and three cups shaped like almond blossoms, each with calyx and petals, on the other branch — so for the six branches going out of the lampstand. 20 On the lampstand itself there were four cups shaped like almond blossoms, each with its calyxes and petals. 21 There was a calyx of one piece with it under the first pair of branches, a calyx of one piece with it under the next pair of branches, and a calyx of one piece with it under the last pair of branches. 22 Their calyxes and their branches were of one piece with it, the whole of it one hammered piece of pure gold. 23 He made its seven lamps and its snuffers and its trays of pure gold. 24 He made it and all its utensils of a talent of pure gold. Bezalel, Oholiab and all the workers take the resources of the people and begin to create the holy things that will be used in the worship of the LORD the God of Israel. The ark is constructed as outlined in Exodus 25: 1-22. The focus on the construction of the objects does take less description than initially given to Moses on the mountain, but the direction of these texts points towards the obedience of the workers to the design laid out to Moses by God. 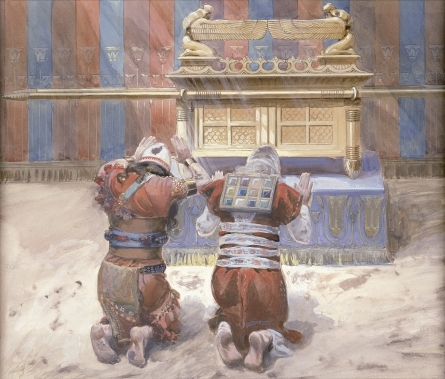 Although the ark itself will come to have powerful function as a symbolic representation of God’s presence it is ultimately a box designed to hold the covenant given to Moses between God and the people. In a much later time for the Jewish people the Torah scrolls will come to have central place as their most precious and holy things, but even here it is a receptacle for the words spoken by God which takes the place of an image of God that the people would rally around. The table for the bread of presence (based on the design of Exodus 25: 23-30) and the lampstand (see Exodus 25: 31-40) are the next two pieces that the narrative lists in the construction process of these holy things. Bread is the basic staple for life and here it serves as a place where a loaf for each tribe can be lifted up before the LORD. Light also was an essential image for the people and in a time before electricity this elaborate lampstand would have been a difficult piece to construct requiring great skill, but it is also a sign of people using their best talents to place within the holy space of the tabernacle. Word of God, light and bread are central religious symbols that occupy a place in the center of the temple and will continue to occupy religious language, symbolism and imagery throughout the centuries. It is probably not accidental that the gospel of John takes these three images (among others) in referring to the meaning of who Jesus is for these early followers of Jesus (Jesus as the Word of God, the light that has come into the world, the bread of life). The altar of incense comes later in the plans that are given to Moses (Exodus 30: 1-10) but the construction of the space in oriented more pragmatically around similar types of items being discussed being crafted together. The detailed description of the anointing oil, and incense in Exodus 30: 22-28 is reduced to a simple line stating that the oils and incense were made as by a perfumer. There is an olfactory element to the worship, an element that some traditions still maintain. Although I am very sensitive to many fragrances we host a Coptic Orthodox church at our congregation which uses incense as a part of every worship service. The holy things for worship include unique smells that are only to be associated with the worship of the LORD. He made the altar of burnt offering also of acacia wood; it was five cubits long, and five cubits wide; it was square, and three cubits high. 2 He made horns for it on its four corners; its horns were of one piece with it, and he overlaid it with bronze. 3 He made all the utensils of the altar, the pots, the shovels, the basins, the forks, and the firepans: all its utensils he made of bronze. 4 He made for the altar a grating, a network of bronze, under its ledge, extending halfway down. 5 He cast four rings on the four corners of the bronze grating to hold the poles; 6 he made the poles of acacia wood, and overlaid them with bronze. 7 And he put the poles through the rings on the sides of the altar, to carry it with them; he made it hollow, with boards. 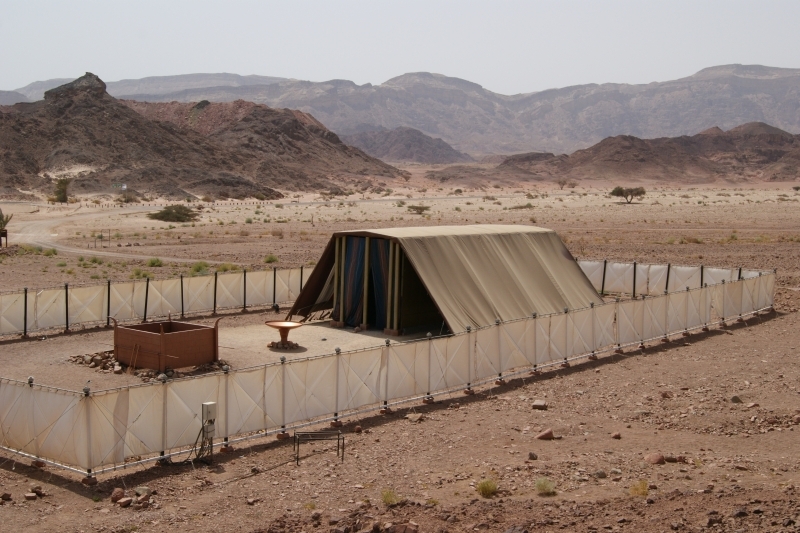 The altar, as outlined in Exodus 27: 1-8, which is made of bronze and occupies a space farther away from the central tabernacle (and uses a less precious material) becomes one of the final items mentioned as it is constructed. Finally, there is the basin of bronze initially described in Exodus 30: 17-21. Within this brief note on the basin is an interesting and often overlooked note that the basin was made from the mirrors of the women who served at the entrance of the tent of meeting. There were women who were a part of the work of the tabernacle! We don’t know what their function was, but it places them near the holiest places. I believe that in Herod’s temple that there is a delineation between the court of women and the court of Israel where only men could approach, but apparently in the description of the tabernacle’s construction there are women who also have a function within the holy places. 9 He made the court; for the south side the hangings of the court were of fine twisted linen, one hundred cubits long; 10 its twenty pillars and their twenty bases were of bronze, but the hooks of the pillars and their bands were of silver. 11 For the north side there were hangings one hundred cubits long; its twenty pillars and their twenty bases were of bronze, but the hooks of the pillars and their bands were of silver. 12 For the west side there were hangings fifty cubits long, with ten pillars and ten bases; the hooks of the pillars and their bands were of silver 13 And for the front to the east, fifty cubits. 14 The hangings for one side of the gate were fifteen cubits, with three pillars and three bases. 15 And so for the other side; on each side of the gate of the court were hangings of fifteen cubits, with three pillars and three bases. 16 All the hangings around the court were of fine twisted linen. 17 The bases for the pillars were of bronze, but the hooks of the pillars and their bands were of silver; the overlaying of their capitals was also of silver, and all the pillars of the court were banded with silver. 18 The screen for the entrance to the court was embroidered with needlework in blue, purple, and crimson yarns and fine twisted linen. It was twenty cubits long and, along the width of it, five cubits high, corresponding to the hangings of the court. 19 There were four pillars; their four bases were of bronze, their hooks of silver, and the overlaying of their capitals and their bands of silver. 20 All the pegs for the tabernacle and for the court all around were of bronze. The court is outlined in Exodus 27: 9-19 and this serves as a buffer zone between the holiest space and the space where the people live and work. The court is also a place where most of the work done by the priests is done, since the entrance into the tabernacle will only occur at the day when the camp is to move or at the specified times given to the high priest. 21 These are the records of the tabernacle, the tabernacle of the covenant, which were drawn up at the commandment of Moses, the work of the Levites being under the direction of Ithamar son of the priest Aaron. 22 Bezalel son of Uri son of Hur, of the tribe of Judah, made all that the LORD commanded Moses; 23 and with him was Oholiab son of Ahisamach, of the tribe of Dan, engraver, designer, and embroiderer in blue, purple, and crimson yarns, and in fine linen. Even in ancient times there is a desire for accountability for the resources invested in a project. This is a phenomenal investment of resources. A talent is roughly 75 pounds, and so at the modern value of gold the 37 talents is worth roughly $46 million dollars, in addition to the cost of the silver, bronze, yarn, spices, oils and the physical labor that went into the construction project. Ithamar, a son of Aaron, is tasked with overseeing the accounting for the work that Bezalel and Oholiab oversee. It also begins to give some idea of the resources necessary to move the tabernacle in a time prior to mechanical locomotion. One hundred silver bases, each weighing around 75 pounds, in addition to hundreds of feet of curtains, poles, the bronze bases and all the furnishings-each movement was a significant undertaking. The tabernacle will involve not only a significant investment of resources to construct but for a people on the move it will also involve a large investment of human and animal strength dedicated to the movement and assembly/disassembly of the structure. The designation of the half shekel for each man over twenty-five is outlined in Exodus 30: 11-16 and the offering for the tabernacle is described in Exodus 35: 4-29 and as Exodus 36: 3-7 where we are told the people brought more than enough resources for this project. This entry was posted in Biblical Reflections, Exodus and tagged Ark of the Covenant, Exodus, Exodus 37, Exodus 38, resources, sacrifice, stewardship, Tabernacle. Bookmark the permalink.